Silk Banners for Worship, Warfare & Ministry. 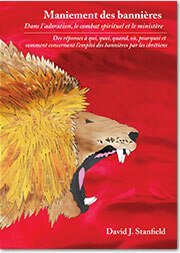 Book now available in French (as well as English & Spanish. Welcome to Out of Our Minds Banners. It is so good to be able to share our ministry with you! Out of Our Minds Banners offers a set of more than 60 unique designs which are applied to silk banners, ribbons, garments, scarves and wraps. And just added Jesus King of the Nations banner…. For each banner design, you will find a summary of the design and its meaning, some Bible references about the concept it represents, and the Name of the LORD linked to it and a breakdown of the design's colours. We invite you to browse through our Online Shop where you can make your selection and purchase quickly and easily. When you're ready to purchase, be assured that our online shopping facility is 100% secure. How to buy banners. You can subscribe to our monthly newsletter and may also view full-colour brochure & silk design gallery. This site services Anzacs, people living and worshipping in Australia & New Zealand. The pricing, postage and regional news here caters for the neighbors “down under”. If you are from another nation please switch to our World-wide site. Out of Our Minds Banners has an extensive workshop & conference ministry. See when and where events are being held at the Workshop Itinerary. Learn about how to organise your own event. Visit our Our Online Shop to purchase banners, ribbons, garments, scarves & wraps and Wielding Banners resources.